This is how he started. With cords and oxygen tubes and needles and preemie diapers that were waaaay too big. I was almost seven years old when my youngest brother was born. My mom was five-and-a-half months pregnant (24 weeks) when she went into labor with him. I remember he had to be incubated for almost 4 months, and I used to draw him pictures and tape them onto the glass of his incubator. We (I and my siblings) weren't allowed to touch him, and even when he came home, he was very protected and we had to be extremely careful. Lane, you were born and have always been the baby. A seven year age difference is quite a lot. I remember your childhood more than anyone else's because I was older as I watched you grow. You've always been so sweet and happy and smart, and I'm so glad your teeny little baby body was strong enough to keep on truckin'. I asked Mom to tell me your birth story, since it was your birthday yesterday. Here's part one of your seven-day journey to birth. 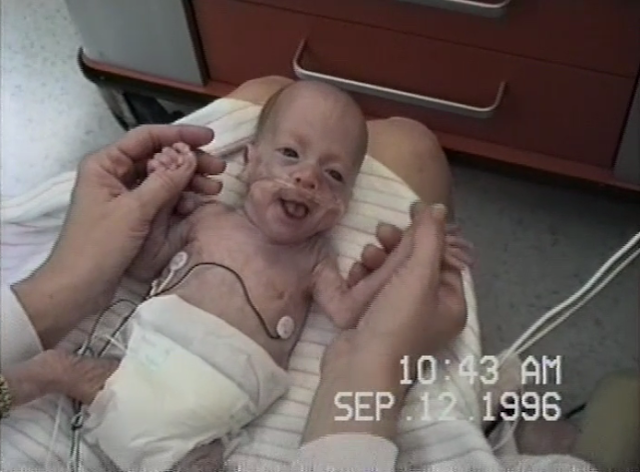 "Lane was due in early October, 1996. On June 3 (approx date) my Aunt Doris had a heart attack and ended up bleeding internally. She was critical for weeks. I spent the night in the hospital waiting room while family traveled to be by her side. I was 5 months pregnant and not in any danger as far as the pregnancy was concerned. Around June 10th I went to the hospital because I had some irregular things happening. They noticed that I was contracting every 3 minutes (which I did not feel) so they gave me a glass of water for hydration and sent me home after one hour. The next day I kept feeling contraction so I kept drinking water, but they didn't lessen and by the time James got home from work I was in hard labor. He drove me to the hospital which was 45 minutes away while I laid in the back seat breathing and moaning. We were both very afraid of what was happening. I don’t even remember who watched the other 3 children we had at home. This is actually a very hard time to recount. We were more scared than we had ever been in our marriage and there was a very real possibility that our baby would die. When we got to the hospital, I was in full labor, fully effaced and 6 centimeters. In a normal full term birth, a woman is 10 centimeters when she delivers. I was diagnosed with a strep infection (vaginal) which produced a watery discharge which I had thought might be amniotic fluid. On the 11th, the doctor told me a strep infection causes labor and that I should never have been sent home the day before. They began medication to stop labor and hoped to get it under control so they could transfer me to a more equipped hospital. Kaiser Anaheim Hills could take babies at 28 week gestation. My baby was at 24-25 weeks gestation. We needed to get to Kaiser Bellflower (about 1 hour from our home). After several hours, the doctor felt I was safe to transfer. James followed in his car so he’d have a way to get home. I was then put in a Labor and Delivery Room (LDR) and proceeded to wait and hope my contractions would stop. From the beginning in Anaheim, my bed was tilted at a 30 degree angle with my head down to get any pressure off my cervix. My bed stayed in this position until Lane was delivered which caused some terrible headaches. The medicine they gave me had a toxicity level and my head felt loopy much of the time. I did not have bathroom privileges and now know for a surety it’s darn hard to pee uphill into a bowl while lying on my back with someone watching. Doesn't that sound exciting? If that wasn't bad enough, I started to bleed. The doctors thought the placenta might be pulling away from the wall of my uterus. This is a catch 22. Bleeding causes contractions while contractions wer causing bleeding. They weren't sure they’d be able to stop the cycle. This is when Heavenly Father took over. James gave the baby a blessing through my stomach. I had noticed a small ache at the upper part of my abdomen. As the blessing progressed, the ache shrank until it disappeared. The bleeding stopped completely within an hour or two after that. Once the doctors felt labor had temporarily stopped, I was transferred to a private recovery room to wait it out. I wasn't put in a room with another mother because most of them would have healthy babies and they didn't want me subjected to the pain of watching families come and go. Our goal was to stay in the hospital for all 3 months until the baby was due. That was best case scenario. We were told I would probably go back into labor and it would keep going like that until the baby was delivered." That's crazy!! So glad he is okay! And my niece wad born at Kaiser Anaheim Hills, it's the hospital closest to both sides of or family and I haven't heard good things about it so maybe it's best she went somewhere else! One of my coworkers had a baby due a month after Quinn was due and he wound up coming a month before and I thought that was crazy, but only five months along? I'm so glad he's okay. Things about birth and pregnancy never cease to amaze me. My sister in law gave birth at around the same time. 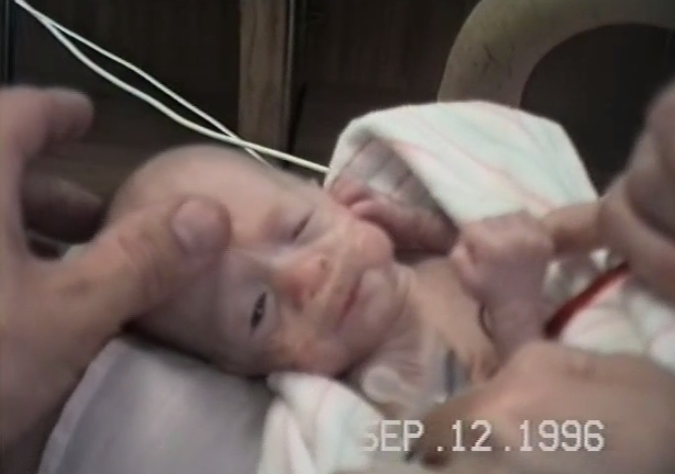 I remember seeing her tiny little baby with her tiny little hands and tiny little body in the incubator. It was both a sad and beautiful sight to see this little baby not fully equipped to survive, but she grew into a lovely little girl. I love stories like these, and I can't wait for part 2! You mentioned your brother being a preemie before, and I wanted the details so bad! This story made me cry because I can't imagine how scared I would be if I was your mother at that time, and especially if I didn't know what a priesthood blessing was. The faith in the room at that time must have been unreal. Can't wait for the happy ending.